Hey everyone, I'm back...hopefully! I don't want to jinx myself but I *think* I am getting back into the swing of things after a really busy summer. I thought back in June that I was going to be able to keep up with everything, but I failed miserably! Sorry about that, and thank you to all who stuck around and waited it out! Here are some polishes from the new-ish Hard Candy displays you can find in most Walmart stores. Bity Blue - microshimmer blue, seemed like it would go on sheer but I actually achieved the pictured coverage in two coats. It's super shiny and pretty! Crush on Ivy is a green sparkly shimmer. Greens don't usually look the best on me, but this one seems really nice. 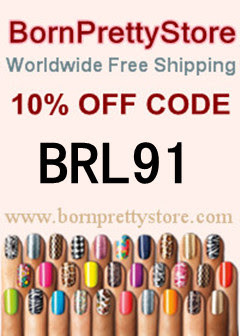 Two coats, nice formula. 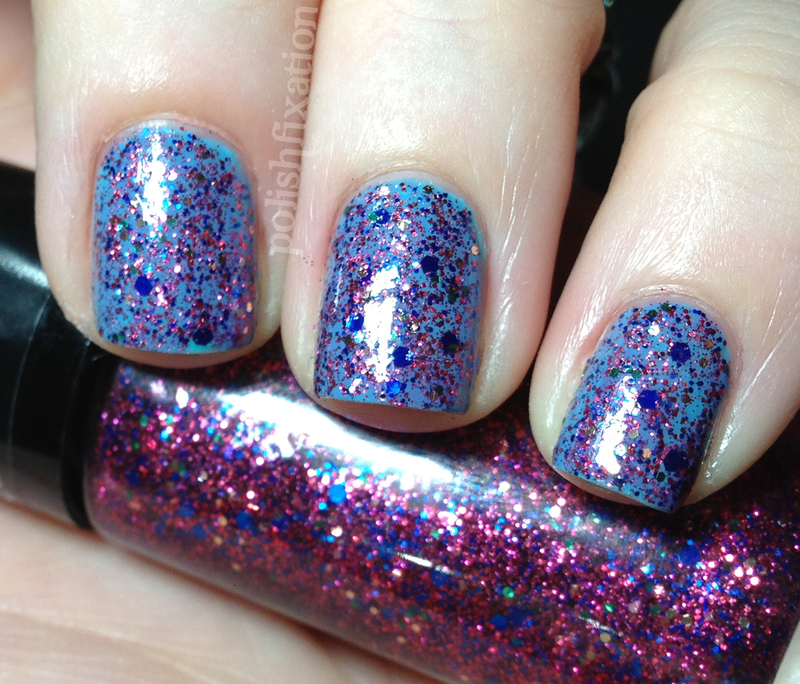 Glitter Jam is a micro magenta glitter with larger bluish purple glitters throughout. Not a huge fan of this one but it definitely covers well and is jam-packed with glitter. Little Hottie is a super bright pink fleck/shimmer. I love this one so much, I am a HUGE fan of bright pinks, and this one definitely didn't disappoint me! It was two simple coats. LOVE! 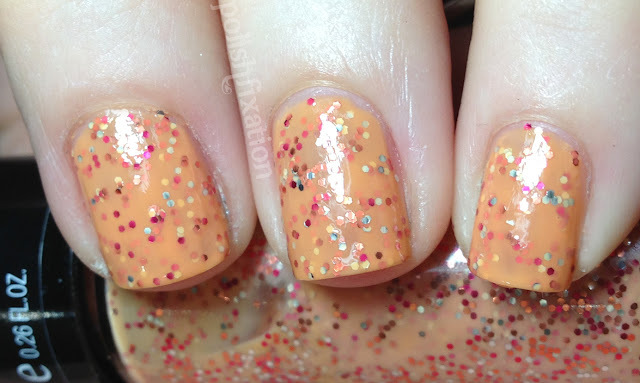 Peach Pop is a peach cream polish packed with small orange and goldish colored glitters. I really thought this one was going to be hard to apply, but I didn't have any forumla problems at all, and was able to cover the nails with 2 careful coats. There are several other renditions of this type in the new collection of colors as well, I am excited to check some of the other ones out too. 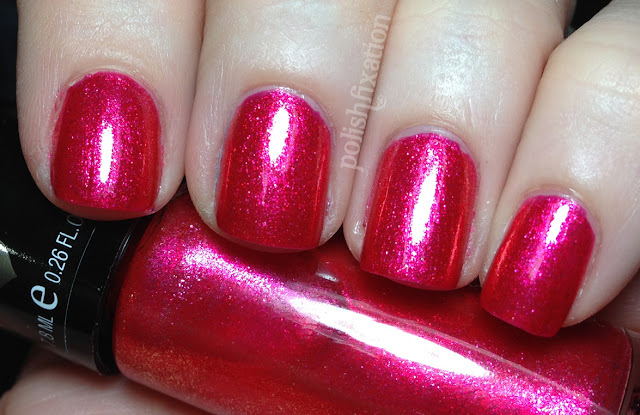 Overall, the new offerings from Hard Candy blow their old polishes out of the water. The display has a plentiful selection of colors and finishes, and lots of sparkly glitters! Those look fabulous! I almost bought Little Hottie the other day :/ I really love the look of Peach Pop, may have to get that one!